I apologize for not featuring a low-in-calorie dessert earlier. Many of us are still sticking to our new year’s resolutions of losing weight, so I thought I’d feature one of my favorite healthy yet delicious (and quick!) desserts. I’m not going to lie; this is actually a breakfast recipe. I just happen to serve as dessert on many, many occasions. Let’s just settle with the notation that it can be eaten all through the day. And with 80 calories per glass, there’s nothing to feel guilty about. Rating: 4.5 out of 5. - Put the thawed raspberries into a blender and puree. 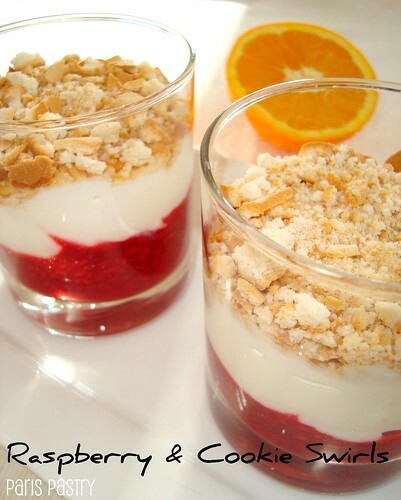 - Spoon 1 to 2 teaspoons of the raspberry puree into a serving glass, top with 2 tablespoons of the yogurt and sprinkle a layer of cookie crumbs on top. 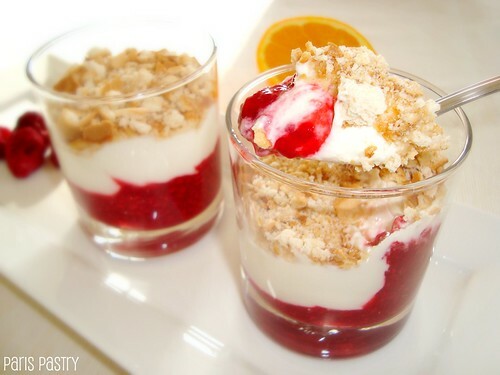 - Cover the crumbs with 1 more layer of yogurt, then raspberry puree and finally cookie crumbs again. - These can be prepared the night before, in which case don't sprinkle the final layer of cookie crumbs until you are ready to eat the swirls but leave the glasses with the yogurt on top, covered with plastic wrap. A nigella recipe that is low fat ... please wait while I pick myself up off the floor!!! Looks just lovely! Oooh, that sounds like sth I want to try! Yummie! Mmmm! I have got to get on the diet train. I love that these look beautiful, sound tasty, and are light! your photos are getting more amazing by the day! nice recipe!! I could definitely eat this all day long! Sounds delicious with oatmeal cookies. Ooh--or speculoos! This looks so delicious AND it's low calorie... what's not to love about it!! YUM! Wow - can't believe that something that looks so delicious is also low calorie. Bravo!